Somebody can explain to me how make the site in differente language. I would like to have the attribute in french and in english. I make it in the both language, but in the search module the french and english display at the same time. And when i seach the proprieties it display the doublon, french and english. How to separed the both language ? How translate the attributes ? Ive got the same issue... did you get to solve the problem? which version of JOOMLA and JOMESTATE are you using? I used FALANG for my property translations / attributes. It works like JOOMFISH for 1.5.
installed FALANG and installed the contentelements for properties / attributes / etc. Rest of the site is translated via the CORE JOOMLA multilanguage function. Ill have a go... thank you!!! Which contentelements from the Flang do I have to use? 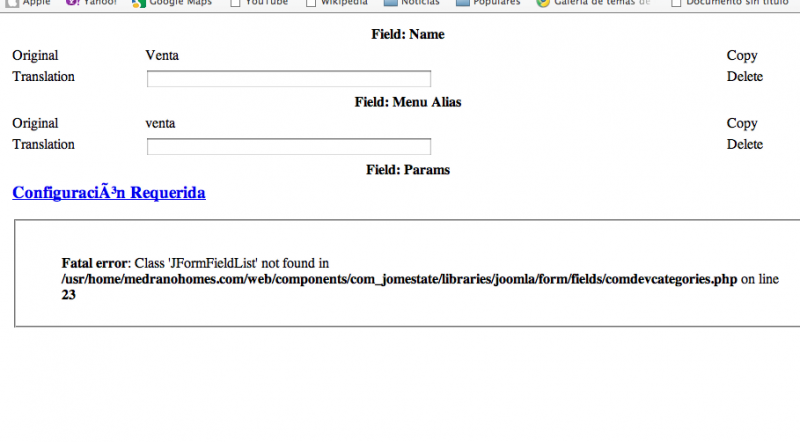 Install the attached XMLcontentelements for JOMESTATE. Install them directly in the FALANG EXTENSION and NOTin the JOOMLA EXTENSION MANAGER. thanks for your explanations, but I have a problem. please unzip the contentelements.zip first after that install the individual XML files in the FALANG control panel. I did that(unzip the file). And when I install the differents xml files, I don't see anything. I'm sure there is a step that I missed. Did you changed the name of the file? please also check in FALANG the tab Content element what do you see in this list?